Farrakhan – AMERICA! THIS IS THE DAY OF YOUR DOOM!! | Stop Obama Now!! Farrakhan – AMERICA! THIS IS THE DAY OF YOUR DOOM!! Farrakhan declares in the Annual Saviors’ Day Conference that the end of America and the destruction of the white race is imminent and calls for an uprising in America. The word “Saviors’ ” is written with the apostrophe in plural form, because the Nation of Islam believes that multiple messiahs can exist at the same time. Farrakhan gave a sermon, entitled “The Four Saviors,” that implied that there would be that many messiahs. The belief is that he and the two co-founders of the Nation of Islam , Fard and Elijah Muhammad, are three of the messiahs. 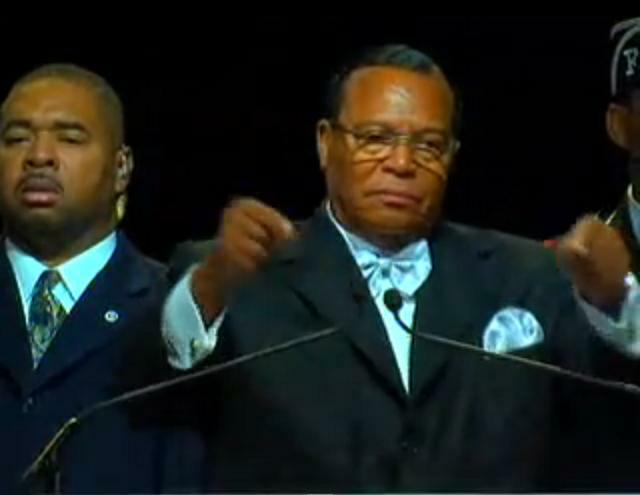 Farrakhan then indicated at the Saviors’ Day conference of 2008 that Obama is a fourth messiah. Obama’s cult-like religious sect in Chicago has a doctrine, which is similar and closely related to the theology of the Nation of Islam. Obama’s self-described spiritual guide, Jeremiah Wright, has been a friend of Farrakhan’s for decades. Obama implied in his book, “Dreams from my Father” that Wright was a Black Muslim in the 1960’s before he went to seminary and later converted Trinity United Church of Christ into a pseudo-Christian Black Nationalist church with a doctrine based on Black Liberation Theology, which is largely a derivative of the theology of the Nation of Islam. Black Liberation theology is designed to appeal more to black professionals and to spread the ideas of the Nation of Islam among black churches and the black community. This is an excerpt from Farrakhan’s speech. The “America’s Day of Doom” quote is near the end of this excerpt, in case you want to fast forward to about 15-20 minutes into the clip. There are a number of these black nationalist religious sects in the broader movement and various groups present themselves as Muslim, Christian or Jew, but they are not accepted as orthodox an any of these religions, having a theology more in common with the broader, Black Nationalist cult movement than with the traditional religion that they present as a facade. That Obama’s sect in Chicago at Trinity United Church of Christ is part of this black identity cult movement is a fact, with which many more people should be very much concerned and speak openly about. It is reasonable to believe that such beliefs do effect his policies and actions. Black Liberation Theology is about a global, genocidal uprising of non-whites against America. That is what Farrakhan is trying to incite here, while calling on Obama to allow it to go forward. One must assume that Obama shares this belief, because he willingly joined a black nationalist group and was a member for twenty years. It is very foolish to assume that he does not share these beliefs or to give him the “benefit of the doubt” about something so important as this. Below is the full video of Farrakhan’s keynote address. Threats to America start at about 25:00 minutes. The first 30 minutes or so are of the most interest. Here is Farrakhan speaking at a NAACP meeting in 1997. The NAACP regularly accuses others of racism, but embraced a racist, traitorous cult leader, like Farrakhan. 2 Responses to Farrakhan – AMERICA! THIS IS THE DAY OF YOUR DOOM!! And to think that all these years the white race worked hard to help Black America get equal rights….well, I guess that appears to be a mistake. They didn’t want “equal” rights, they wanted the white race abolished. How are all you people who call some people racist? What would you call Farrakhan? Eddie Murphy - Kill the White People!